Introducing the next wave in Velodvne technology-the HGS Series-delivering powerful, low distortion bass from an elegant ultra-small black gloss cabinet. Simply put, big sound from a very small box. The updated servo controlled system is linked to unique Dual Tandem voice coil speakers driven by a Class D amplifier that delivers more than 3000 watts of peak power. The HGS Series is the ultimate choice for any system including custom home theater applications, with only a single, front-firing driver allowing easy, unobtrusive installation. This is one of the best sounding subs there is when working but the amplifiers in these are total garbage. The servo goes bad, the amp itself goes bad. The rated power on the amp is also total BS. This amp is maybe 300 watts RMS max. Take the plate amp off and it weighs like 4 pounds. If your amp goes (which it will for sure), don't waste your money getting it fixed. Just take the plate amp off, fill in the small opening that the wires come out of and get a powerful external amplifier to power it. I put a 2500 watt pro audio amp to it and it sounds better by FAR than it ever sounded with the cheap plate amp even with the servo unhooked. Super tight bass wth NO boominess. 20 Hz now comes through as strong as 80 Hz. This thing hits hard even on subsonic frequencies. Amazing. - Disappears into the room. - Plays deep and loud without strain. - Heavy and large, but it has to be. - Expensive, unless you can appreciate the wonderful sound. An audiophile I thought I was. But the more electronics I listen to, the more I realize I will continue to hear things I have never heard before. In this subwoofer I have heard several good things I have not heard in my two previous subwoofer purchases, an HGS-12 series 2 in my theater and a DD12 in my stereo room. Note that I use the Velodyne SMS-1 equalizer in my theater room with the HGS-15, and listened to the equalized sound for this review. I had the SMS-1 equalized with my HGS-12, and re-calibrated it for the HGS-15. Most of the reviews I read here speak of sheer output capability. The HGS-15 does play sounds to low frequencies and at high decibel levels. I re-watched the battle scenes from Gods and Generals on DVD, with high expectations from having heard live Civil War ammunition in Winchester, VA, and having seen the movie at the Senator Theater, the only movie theater in the Washington, DC area that sounds consistently better than the sound at home. With this subwoofer, I am finally pleased with the realism of the battle sound. And that is more the point of my review. The thing that surprised me most about this subwoofer is how correct the sound is, more correct than I thought possible from a subwoofer. It disappears into the room. I've read reviews about subwoofers that supposedly do this, but had not a clue what the reviewers were speaking of until I bought and listened to this subwoofer. My old subwoofers hid themselves fairly well, but I could immediately tell that a sound was subwoofer in origin vs. a main speaker sound. 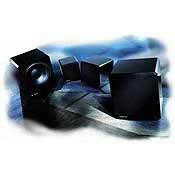 My theater main speakers play down to 30Hz, but if I plan to listen to stereo while in the theater room, the best sound is attained by crossing over all sounds to the subwoofer at 80Hz. This subwoofer is more clean, or so my sensitive right ear tells me. All Velodyne HGS and DD subwoofers are engineered to play with very little distortion. This one plays with less audible strain than my old HGS-12. I feel more comfortable in my theater listening to movies at a higher volume than before. The subwoofer announces its presence much less -- it simply plays the sound and quickly gets out the way of the next sound. And because the sound is better, I am able to focus more easily on all sounds, coming from the subwoofer and all other speakers. I hear more sounds, even at the same volume level I used before. Strings are strings and percussion is percussion and all other bass sounds play with a distinct acoustic timbre -- this is in direct comparison with the DD-12. And with my ears more relaxed on the bass sounds, I am able to hear more of the higher frequency sounds from the main speakers. The speakers in my theater are not meant to play as nicely as the speakers in my stereo room, but they sound much closer in fidelity now that the subwoofer has stepped out of the way and I can focus on them. This subwoofer is a gentle giant. Prodigous is a good adjective for it's output when used to demo. Tight and tidy is best with my speakers nad the depths plumbes would do a proctologist proud. Crap amplifier. Expensive to repair. Crap warranty on repair. Reliability is questionable even if lightly used. This is my personal experience-not an opinion. Very capable of performing it's design function. I have Martin-Logan Aerius as stereo mains. The cross over allows for a fine matching as the M/L 8" woofers are wholly incapable of providing any meaningful bass. (Nor were they meant to.) The warranty is two years, parts and labor. My amplifier failed about two years and 10 months after purchase. It will cost $515 to repair. The amplifier module is self-contained and replaced as a whole. The authorized repairman states that it looks just fine. It just doesn't work. I asked if there was a possibilty of a voltage problem, do I need to provide added protection? He said it couldn't be determined. I attempted to email Velodyne. They have no web address for us consumers. They do provide a phone number. Since I am willing to pay for performance, and this unit is now not performing, a determination needs to be made as to this products longevity. The warranty for the repair is 90 days for parts and labor! $515 for a 90 day factory parts/factory authorized repair warranty! Is it just me or does this sound unreasonable? The strange thing is that my wife is not normally appreciative of the output from this unit and therefore it is lightly used. With servo-control I don't know how you could over-load the amp anyway. So you are warned. If any one else has suffered this acoustic/financial wounding, please contact me. I am a bit of an activist. Incredible bass output at any volume. Able to blend with any system. In one word "Unreal" sound output with this baby. The looks of this sub is incredible as well. Makes a nice piece of furniture. Does need a break in period. But give it time and listen to the way the sub changes it is awesome. Morspped and accuracy than one will ever need. My cht 15 cannot keep up with this thing...so off to auction it goes.. All other positive reviews are right on and the advice is what compelled me to buy one of these. I cant wait to get a second one and run as a stereo pair. Well nuff said run out and buy one and you wont be dissapointed. Absolutely the best sub imagineable. There isn't anything that can hit this low and hard. Like other reviews state at first I wasn't that impressed but after it had a chance to break in, WOW!! There's such a difference! Has knocked pictures off the walls and things off shelves. Will annoy all you live with when they're trying to sleep along with giving them headaches! Is better with movies than music but do WONDERFUL with both! Small, beautiful, great features, good quality, powerful, tight, clean and clear. MUST, MUST, MUST be broken in to sound good, be patient. Maybe expensive to some, but I am very happy with what I got for my money. Keep reading, this will end as a positive review. My system includes: -34" Philips widescreen HDTV -Philips DVD-Q50 DVD/CD player -B&K AVR-307 receiver -APC Smart UPS 1400 battery backup -PSB speakers (Stratus Goldi mains, Stratus C6i center, Image 10S surrounds, Image 1B rear surrounds) -Velodyne HGS-15 sub I was using a Velodyne CHT-15. I feel this is a good sub for the money, but I just wasn't happy with the clarity, especially with music. After reading lots of reviews, I popped for the HGS-15. With high expectations I eagerly unpacked the sub and wired it up with my current CHT-15 so I could switch back and forth between the two for comparison. I was waiting to be blown away. And boy, was I ever. The HGS-15 was bad, really bad. Side by side, the HGS was no louder than the CHT, and it distorted more! This thing was muddy and weak, and my stomach sank as I contemplated the reality that I just spent a lot of my money, and got nothing in return. I was flabergasted, and heart broken. Well, I had read much about subs needing to be broken in, but since my CHT never seemed much different after a few months of use, I was skeptical. So, hoping for the best, but sadly not really expecting any improvement, I began breakin. I cranked the sub volume up to 3/4, put on music and movies, and left them playing loudly everytime I left for work or went out on errands. I could hardly believe it, but everytime I played something, the sub was cleaner, clearer, tighter, louder, and more defined. At this point I have played it fairly hard for approximately 30-40 hours, and it sounds great. This sub is now everything I had hoped for. It blows the CHT out the window in every way. I have no un-met expectations, and really have no desire for anything about it to be better. I rate it a AAA+. Movie bass is definately better, but I am surprised EVERY TIME I play music at how tight and clean this sub is. If this sub improves more over the next hundred hours it will just be icing on the cake. I always thought people who said their sub improved with breakin were deceiving themselves. I can say that in my experience the CHT-15 didn't improve much, but there is absolutely no comparrison to the HGS-15 after breakin compared to before. It becomes a different product. My recommendation is buy it, and break it in, and you will NOT de disappointed. Accurate, deep, powerful bass extension. Capable of thunderous wall shaking performances. The most believable bass I have ever heard. Fast and responsive on musical performances. High quality construction with versatile inputs. Remote control. None really. It's heavy and that's a good thing. Eviction becomes a possibility. I listened to many subs before purchasing this unit. None impressed me more than the HGS-15. The first time I heard it I knew it had to come home with me. I have Klipsch Reference speakers for my home theater and needed something that could do justice in the bass department. Well I found it! Outstandingly clean, powerful bass. It's great with music and kills on movies. There can be no match for it. I keep the volume knob well down and it still is all the bass you'll ever need. It's never boomy either. Buy one and it will be the last sub you'll ever buy. Unless of course you want two of them. I am a poor college student that has been slowly building up my system over the years. i have a pretty good sized room that used an older model velodyne sub (ct-100) that was the best that i could buy at the time. it boasted of 175 watts RMS and a 10 inch woofer. now this speaker has performed admirably but just was not the menacing power that i desired. i do not fancy myself as a bass-head so for quite some time i overlooked the importance of good strong clear deep soul-shattering bass. i made the critical mistake of visiting my local high-end audio retailer and heard this sub for the first time. i must confess that i have a weakness to material possesions reguarding home theater especially when i find something that will revolutionalize my listening experience. so i worked for months and just bought this monster and have withdrawal symptoms whenever i am forced to leave my room. the thing that makes this sub so good isn''''t the loudness, it is how clean and clear the bass is. i expect to never have to upgrade my subwoofer except to purchase a second one after i graduate and get away from complaining neighbors. in one sentence describing the addition of this subwoofer to my system i will quote a line from "Slapshot" "i''''m makin it look mean!!!!!" I am a poor college student that has been slowly building up my system over the years. i have a pretty good sized room that used an older model velodyne sub (ct-100) that was the best that i could buy at the time. it boasted of 175 watts RMS and a 10 inch woofer. now this speaker has performed admirably but just was not the menacing power that i desired. i do not fancy myself as a bass-head so for quite some time i overlooked the importance of good strong clear deep soul-shattering bass. i made the critical mistake of visiting my local high-end audio retailer and heard this sub for the first time. i must confess that i have a weakness to material possesions reguarding home theater especially when i find something that will revolutionalize my listening experience. so i worked for months and just bought this monster and have withdrawal symptoms whenever i am forced to leave my room. the thing that makes this sub so good isn''t the loudness, it is how clean and clear the bass is. i expect to never have to upgrade my subwoofer except to purchase a second one after i graduate and get away from complaining neighbors. in one sentence describing the addition of this subwoofer to my system i will quote a line from "Slapshot" "i''m makin it look mean!!!!!" It shows you the low frequency accuracy and definition of your music source and preamp., can be used with high end equipment. Very clean in the real low bass. The range of settings and filters and inputs are very good for fine tuning the sound, so this sub is highly recommended for the uses I described above. If you have a very large room, say over 7000 cu ft, or one that is low fequency absorbing (concrete/stone) then you might be better off with the HGS 18. These work best in a midsize, average room. Or you might need 2 of these in a large room. If you want chest thumping disco midbass, these are not suitable. In fact they are a bit slow over 50Hz so buy them if you have (almost) full range speakers and not to complement mini monitors. Be careful with the glossy finish, can scratch. Have lived with these subs for nearly a year. The sound is clean and articulate, ideal for jazz and classical. Lots of power. Amp. rated 1250WRMS but damping factor appears to be average, and these are not suitable for chest thumping transients, nightclub style. Subwoofers from Infinity, M&K, Pioneer, B&W. All these only auditioned, not purchased.